In the last blog article, we introduced you to the 3 PROVEN pillars of fat loss. Today we’re back (just like we promised) to give you an example workout from each individual Pillar (animal) so you can transform your turtle and hamster mentality into that of a short burst, fat burning gazelle. And we’re not talking about a Tony Little-style Gazelle here either. This isn’t some gimmicky philosophy. This IS the real deal. Remember that if you want to be a real fat-burning Gazelle, you will sometimes act like a hamster (Pillar 1). This is for recovery purposes and to prime your metabolism to burn more fat when coming out of your turtle shell to act like a Gazelle (Pillars 2 and 3). Also, it’s crucial that you incorporate some type of resistance training like weights or MRT (Metabolic Resistance Training) into this plan if you really want this to work. We know this is kind of obvious to most of our readers; we just wanted to make sure we didn’t leave it out. Speaking of metabolic resistance training (MRT), one of the world’s best metabolic resistance training experts (our “go to” guy and friend), recently shared some of his best stuff with us…you can learn more about how to use it at the end of this post. Before we give you some sample workouts, remember that you’ll never see results unless you understand the number one component of fat loss. What is it? One word. 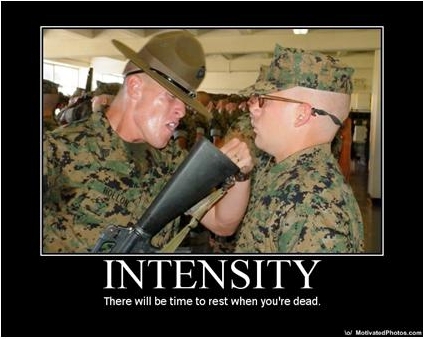 Are you intimidated by intensity? If so, relax. You’re not alone. Here’s the key. Apply our intensity scale below to YOU personally. Your current age…your gender…your current level of condition (or any other limitations you may have). *Intensity levels are different for every person and are based on your current condition, age, gender, or other limitations, so please gauge your intensity level based on where you’re at right now personally. You can also apply this scale to other types of exercise besides running or sprinting. In the aerobic pillar, oxygen is used to break down fatty acids and glucose to release energy. In other words, oxygen is primarily present so you can go for longer durations at a steady pace and the majority of fat calories burned happens during the workout itself. Just remember: Aerobic means with oxygen and anaerobic means without oxygen. This is the pillar just above Aerobic training. You can typically stay in this anaerobic pillar for 2 to 5 minutes at a time before letting your heart rate come back down and recovering. This pillar has several important benefits. Research shows that threshold training allows your body to respond continuously from the aerobic type training discussed above. This is important to know because so many people hit a wall when they get stuck in the aerobic pillar (a.k.a. the hamster wheel). It will also help you burn more fat and calories when incorporating a base of pillar 1 and pillar 3 along with it. Lastly is creatine phosphate (Get Lean In 12 intervals and H.I.I.T.). This system can only support high intensity effort for 15 to 60 seconds at a time. The main thing to remember with Get Lean In 12 intervals and H.I.I.T. workouts is that although they are only 12 to 20 minutes in duration, they will increase both the “aerobic” AND “anaerobic” systems at the same exact time. This is typically unheard of when it comes to exercise. Also, study after study shows your metabolism will be elevated for up to 48 hours from just one pillar 3 workout. Again, just remember the “more” is not “better” GL-12 philosophy. Doing a bunch of pillar 3 workouts every week is not the answer, but it definitely yields the most results for the time invested. Continuously using all 3 pillars is the solution. It’s nice to know that the time and effort invested into pillar 3 will still be working up to 2 days later…even while you’re sleeping. Now that’s a beautiful thing! One final note on Pillars 2 and 3. Feel free to walk briskly for 10 to 30 minutes afterwards if time permits. A lot of research shows this will help the heart utilize oxygen properly and enhance fat loss by burning off the Free Fatty Acids that your body will release during high intensity bursts of exercise. The strategy above is how we personally went from exercising 8 to 10 hours every week, alllllll the way down to just 4 or 5 hours a week. Ironically, we doubled our results at the same exact time. I know we’ve beaten this drum to death, but more is NOT better. Got it? There’s one more final strategy that will help you maximize your body’s natural fat burning potential with this approach. We call it “sequencing”. When you use this approach sequentially in the proper order, you can force your body to feed on more fat. At least 20 comments and we’ll be back in a few days with the exact weekly exercise schedule you can use to make all 3 of the PROVEN pillars work together synergistically and sequentially. There’s more metabolic trickery coming your way in a couple of days. But you have to leave your comment and we’ll be back to help you cross the finish line. Definitely will do this. Can’t wait for the exact weekly exercise schedule to posted! LESS time = MORE results…..Brilliant! We have “the PILLARS”, we just need “the PLAN”! This is great! I teach spin and I try to design my classes along these same ideas! I’m on board too! I keep doing the combination of the 12 minutes, and on the weekends doing longer hikes and workouts to balance. Now need the exact formulas to help me obtain the results I desire. Thanks for all your support and motivation. I really enjoy the threshold training. looking forward to something more challenging. Looking forward to the schedule! I’m excited to share the synergistic “sequencing” cardio schedule….BUT we need MORE comments….share it on FaceBook…Twitter…forward it to your friends….gotta have 20 before I post “the schedule”…. Thank you for the encouragement to consider where we are personally and not compare ourselves with others. Nice site. Looking fowad to the schedule. Thanks for the formula. Here’s another vote to get the schedule up quickly! I started about 3 wks ago seriously working out using these techniques. Now I did’t know I was doing so close to above until I just read this..I focused on several HIIT 12 min workouts with different ones other days with weight lifting as well. BUT let me tell you… I have NEVER gotten so many comments from people this fast after starting a weight loss plan for myself. I mean 3 wks and I have clothes that I have never worn because they never fit on my body and now….they are loose. I will never stop doing this. I feel amazing and the fast results is what I needed. Also… I have/had like 50 lbs to lose so this is doable by anyone. I LOVE that I go to the gym and I am in an out and people can’t believe I am getting the best results far more than anyone else. Thank you so much for being a constant in my email… It took awhile but I finally started to listen. I’m a true believer now !! Thank you thank you thank you. Looking forward to a plan to get me out of a rut! Thanks for the info! I was finding that try as I might,I couldn’t do many “Pillar 3” workouts in a week….it will be nice to mix things up! Can’t wait for the schedule!! The only time I have gotten results is when I do interval training. Looking forward to a new schedule. When doing the different pillars is the warm up time included. If you are suppose to do 30 minutes it that 30 minutes including the warm up time or is it 30 min plus the warm time? The warm up time is not included in the intervals but it IS included in the total time. Repeat 5 times = 20 minutes + 5 min warm up = 5 min cool down = 30 minutes total. Can’t wait for the schedule. have been dieting for 6 months and lost 25 pounds. Each time I plateu I switch diet plans. I started plateauing on the last diet and then started exercising using the 3rd pillar. Saw a loss of 1.5 pounds the first day and another 1.5 pounds the second day! By the way the current diet I’m on is by Wendy Chant. I’m very interested in seeing the pillar exercise plan so I can finally figure out how to combine the exercise with food maintenance. I love when people comment and especially diane motivated me today, thank you. Because Wendy Chant’s book changed my life I always love to hear from Shaun! I trust what he says! I am really confused. How we can use all 3 pillars?